The Building Team makes suggestions to the Vestry about capital improvements. The church is handicap accessible and we also have a handicap restroom. In late 2010 we added a new electric, changeable copy sign facing 18th street. We have a new facelift in of the church in 2013. In 2014 we where able to paint the inside of the nave. 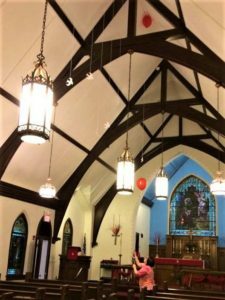 Our goal is to make St John’s Church beautiful, as well as functional for all ages.